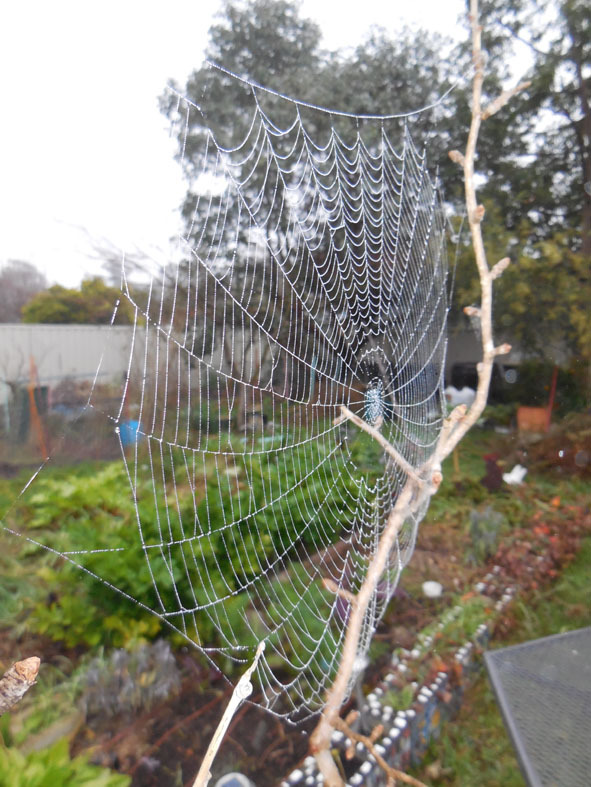 The cold and foggy mornings bring unexpected pleasures in the shape of water-dropped webs. We’d just arrived back from a weekend away when I noticed that our chickens were out and running around our back garden. 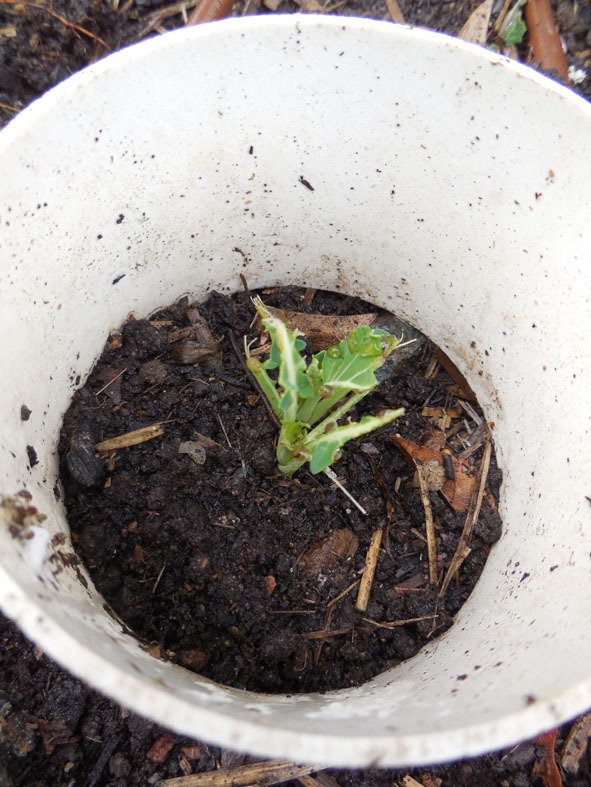 What’s left of one of our broccoli seedlings. It turns out that we didn’t latch a small door in the side of the chicken pen and consequently the ‘girls’ had a big weekend out ravaging the garden. Worst hit were our broccoli seedlings and a small bed of walking onions that got thoroughly dug over. At least the girls didn’t get eaten by a passing dog or nearby falcon. Hopefully the broccoli seedlings will regrow their leaves. I was also enjoying my time away. We just ‘had’ to stop in to the second hand yard at Molong. I was actually on the lookout for older style garden gates to be used as part of a planned upgrade to the chicken containment zone. As is always the way, the shop had 3 gates last week but none the day we arrived. Oh well. Always on the look out for retro pots and paraphenalia I did find a new decoration for the garden. 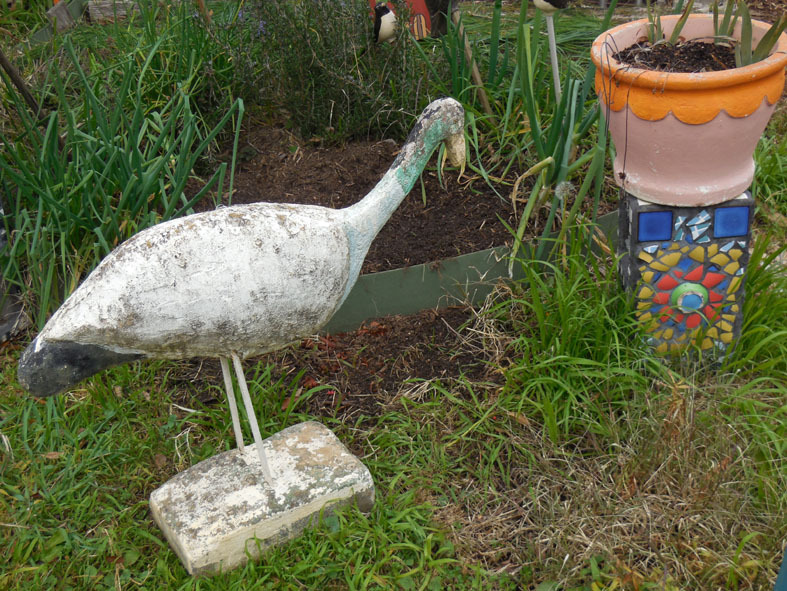 This home-made sculpture of an ibis, or is it a very tall duck? My latest garden sculpture find. You might be relieved to hear that I passed over two concrete ‘Mexicans’ for this gem of amateur art. If you have lived in Canberra for any length of time you will know that there are many restaurants tucked away in the small shopping centres that are spread throughout the city. Our friends organised a get together at one such place last weekend. We met at Joe’s Thai, in Waniassa. The bright and fresh decor was an auspicious start to the night and the place was packed. Our friends had learned the hard way, twice, that you need to book if you want to get a table here on a Friday or Saturday night. The staff were attentive and the food rolled out in good time. You can see a menu here. All your Thai favourites can be had here. I had and entree of prawn cutlets coated with crunchy coconut, followed by a green curry seafood. Two stand out dishes on the night were the stuffed eggplant, the eggplant is hollowed out then stuffed with pork mince, I’m not sure if there wasn’t more involved, but who cares when it tastes so good. 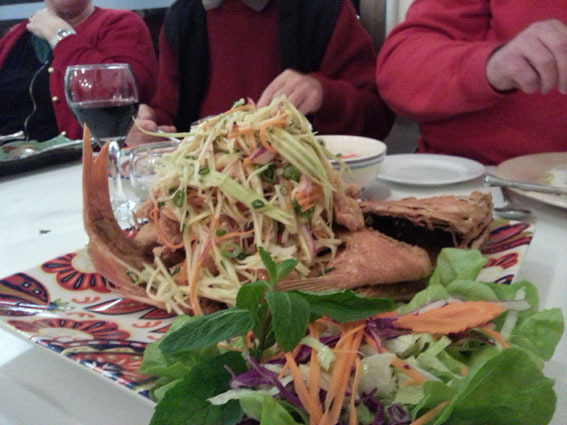 The prize for the most spectacular dish definitely went to the Thai Crispy Snapper with Mango Salad. Our friends had arranged in advance for this dish to be made. The fish is filleted and then individual pieces are deep fried. The salad, served on top of the fish, was lively with really zingy flavours. Thai Crispy Snapper with Mango Salad. So it’s a big thumbs up for Joe’s Thai. See you there sometime. Joe’s Thai, Sangster Place Waniassa, Ph 6231 9100, Mob 0449 768 537, open 7 days for lunch and dinner.